There are times in my knitting where I feel completely overwhelmed at the amount of WIPs that I currently have on the needles. 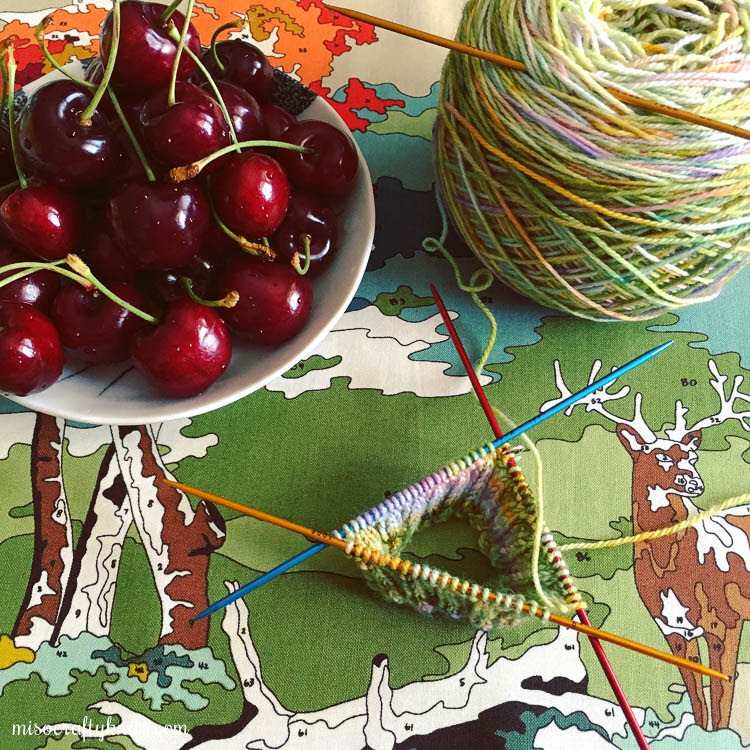 Then there are the times in which I feel like I have absolutely nothing to knit on, even though I have a handful of WIPs scattered around on my coffee table. There's the rare time in which I'm just simply bored of every single project I'm working on. Like I said, it's rare, but it does happen. Then there are those times where I'm rummaging through all my projects trying to suss out which among them is the most mindless and easy to tote around - only to discover that all the projects are either too big and cumbersome, and/or at a stage where they need a bajillion stitches picked up or require some chart reading (the latter being not the best for running errands and for quick stitching here and there). This last point is the reason why I decided to cast on another pair of socks. That, and well, I couldn't resist this gorgeous skein of sock yarn any more!! Can you blame me though? It's so beautiful that I kept the skein right next to my keyboard as a gentle reminder that I should knit it. And soon. The yarn is by indie dyer, Lichen and Lace, from the East Coast of Canada in the province of New Brunswick. I also decided to switch things up a bit by knitting this pair of socks with DPNs. For my birthday last month I decided to treat myself to a set of Addi FlipStix. I figured that since my hands weren't loving the motion of sock knitting that maybe I'd try knitting them up in differently. Using DPNs forces my hands to not only hold the needles and work a little differently from my usual way, but also without the "death grip" that I typically have on the needles (re: leads to major cramping). Aside from the above factors, I wanted to try out the FlipStix because I liked the idea that these ultra lightweight aluminum needles had a super pointy lace tip on one end and a more rounded Turbo tip on the other. I realized with my previous DPN knitting attempts that I was using needles that hindered my knitting and lessened my enjoyment. I found that I didn't like sock knitting with wooden needles because I felt like I was going to snap them in half at any given moment, some metal needles just felt too heavy and cold, and other needles were comprised of two different materials that resulted in a join somewhere along the shaft that caused my knitting to snag with each stitch. I hoped that with the FlipStix I won't encounter any of these issues. So far, they've been great. But we'll see when these socks are finished. 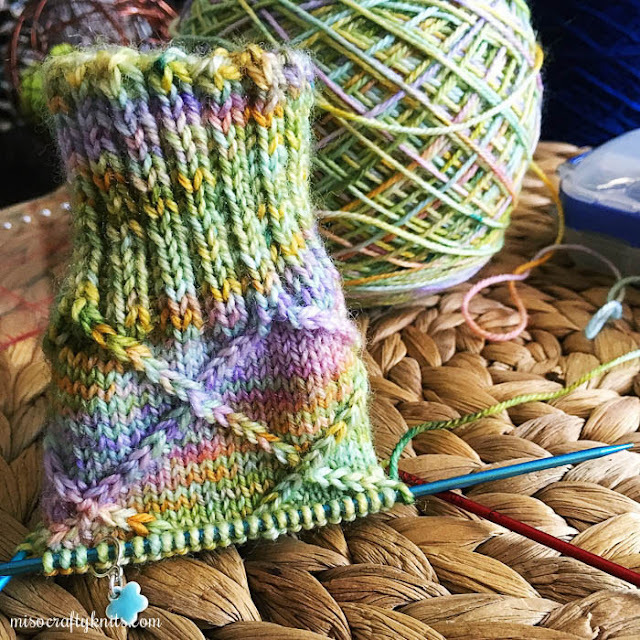 I considered knitting up another pair of plain vanilla socks because I really wanted to show off the beautiful colours of the yarn, but decided against it because I was starting to get bored with plain vanilla. Not to mention that the current socks on my needles, Vanilla is the New Black, is plain vanilla (with a twist) and I'm also working on the sleeves of both my Breathing Spaces, which sort of feels like sock knitting too. So I took a quick look at my sock queue and library and immediately picked out Business Casual by Tanis Lavallee (of Tanis Fiber Arts). I've always wanted to knit this pattern but you know how it goes, you queue a pattern with every intention of knitting it but then more and more patterns come along that you want to knit, and soon the patterns just pile up and you just simply forget what's at the bottom. Well, not today, my Friends! I think, or at least hope, that the colours are light enough to show off the stitch pattern and that the stitch pattern will be able to highlight the colours with the two-stitch cable. So far it has been a complete joy to work on these socks and I find myself trying to sneak in a round here and there. Everything about this project has been fun and addictive - the yarn, it's so gorgeous that I want to keep knitting to see what colour pops up next and how it will look stacked up on the others; the pattern is really easy to knit and to memorize, and found that halfway through the first repeat I didn't have to refer to the pattern for every round. Even now, I only look at the pattern when I get to the round where the cables meet and I need a refresher as to which way the cables are crossing. As for the needles, well...I haven't converted to DPNs but I must say that I'm thoroughly enjoying these Addi Flipstix. They are fantastic! I'm loving the pointiness of the lace tips and get such a kick out having different colour needles - which is so superficial but hey, it makes me happy! I've always known that I'm a tight knitter and usually it's sock knitting that reminds me to loosen up. I noticed that a couple of my DPNs have a slight arch to them...Oops! Not unusual for me at all, cause if you look at some of my sock needles, a lot of them are no longer straight! I'm also not using a cable needle or even the fifth DPN for the cables. I usually try to not use cable needles whenever possible (I'm pretty comfortable up to four stitches, after that...it depends on the cable). I find I work much faster without a cable needle and it's a lot less fussing around. I have to watch myself to make sure I'm on track with the height of the leg, as I'm pretty sure I could keep on knitting before realizing I've made the leg too long. As of this post I'm almost finished with the last repeat before you're suppose to start the heel. I haven't decided if I should add an extra repeat or to keep the height as is...which means I should probably put this project down for a bit before I end up with one long argyle tube, and knit on say, one of my Breathing Space tunics. After all, Stash Dash is still going on and I'm barely breaking 1k. So sad. I have a little over a month to get to that 3k finish line! Cute yarn; I do like its coloring and I really don't blame you for wanting to cast on socks. I really like how Business Casual is going with the colorway. Dumb question here but are Addi Flipstix metal as well? 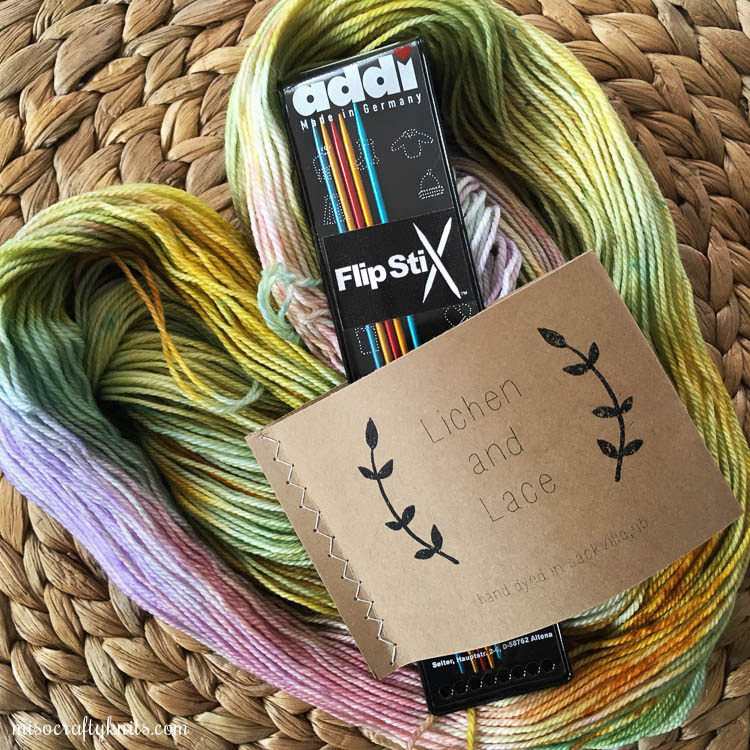 that lichen and lace yarn is totally on my to-try list, it looks beautiful. I always bend my dpns, too! Those flipstix look fun, I love coloured dpns (and have a few sets, even though I don't often use them) I've been meaning to try the curve dpns by Neko. They look so interesting!